Lock in a great price for Holiday Inn Berlin Airport - Conference Centre - rated 8.2 by recent guests. Near airport, over priced, standard business hotel. The room was hot overnight and AC didn’t work. The restaurant was very good. I had a great dinner. One of the best hot buffets I have seen at a hotel of this price/category. The food was very high quality. Clean, neat, close to the SF airport and the shuttle helped to get to and from the airport. The room was very comfortable and the food was excellent and reasonabily priced. This hotel is incredibly comfortable for a night stay between the flights. Located next to Schönefeld airport, it is an excellent choice for anyone who is passing by Berlin without willing to stay and explore the city. Book breakfast! It is delicious and offers a wide selection of dishes. Free airport/S-Bahn shuttle. Nice sauna and SPA. Great breakfast. Everything for us was ok. We were here with ours car, so the place for us was well, 15 min from Berlin city center and about 20 min from Tropical-Islands-park. Holiday Inn Berlin Airport - Conference Centre This is the official star rating given to the property by an independent third party - the Hotelstars Union. The property is compared to the industry standard and scored based on price, facilities and services offered. Use the star rating to help choose your stay! This 4-star hotel offers a free 24-hour shuttle to Berlin Schönefeld Airport, just 1.2 miles away. Spacious, soundproofed rooms with flat-screen TV and a top-floor spa are available here. All air-conditioned rooms at the Holiday Inn Berlin Airport - Conference Centre feature an Infotainment system, a seating area, and free tea/coffee facilities. The all-day restaurant serves delicious breakfasts and Mediterranean cuisine. The To Go Café in the open lobby serves snacks around the clock. In summer, you can dine on the terrace, or else enjoy drinks and coffee on the roof terrace or in the bar. The Holiday Inn Berlin Airport's stylish RelaxInn Spa & Health Club area features a sauna and gym. The spacious terrace enjoys great airport views. Flughafen Schönefeld S-Bahn Train Station is less than 0.6 miles away from the Holiday Inn. The RE7 and RB14 regional train lines run to Alexanderplatz Square in 20 minutes, and the RB19 regional train offers direct connections to Südkreuz, Hauptbahnhof (Berlin Main Station), Gesundbrunnen and Potsdamer Platz in just 28 minutes. The Berlin ExpoCenter Airport exhibition ground is also just a 5-minute drive away. Holiday Inn Berlin Airport - Conference Centre has been welcoming Booking.com guests since 2 Jul 2005. 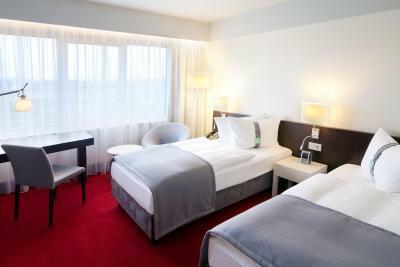 When would you like to stay at Holiday Inn Berlin Airport - Conference Centre? This modern room offers a flat-screen TV with satellite channels and tea and coffee facilities. The private bathroom comes with toiletries and a hairdryer. It also has a small seating area and free WiFi. Guests receive a complimentary bottle of mineral water on arrival as well as free use of the hotel's spa. 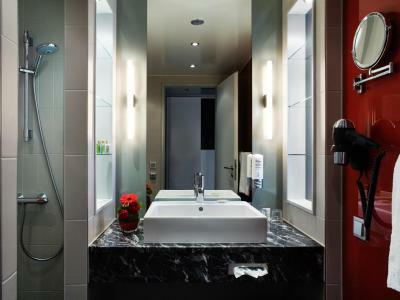 This modern room offers satellite TV and a private bathroom with toiletries and a hairdryer. It also has a small seating area. This room is extra spacious and includes free WiFi. This room offers air conditioning, complimentary tea/coffee facilities and soundproof windows that open. There is also a flat-screen TV with international channels. This twin room has a soundproofing, electric kettle and air conditioning. The Holiday Inn Berlin Airport - Conference Centre has been the premier location for business and leisures guests in the airport region. House rules Holiday Inn Berlin Airport - Conference Centre takes special requests - add in the next step! One child from 6 to 17 years is charged EUR 20 per person per night when using existing beds. Holiday Inn Berlin Airport - Conference Centre accepts these cards and reserves the right to temporarily hold an amount prior to arrival. Please note that the spa area is only free for guests staying in the Superior and Executive rooms. Guests staying in Standard category rooms can access the spa area for an additional fee. Upon Check-in, the credit card will be authorized for the full reservation amount. Good location with airport shuttle. Restaurant on site & clean & comfortable rooms. wi fi not working, room temperature control working but not efficient. Location was a bit too far from anything to walk. At check-in I was given at first a room where there were still carried out works on the plumbing, but quickly I was given an upgrade with the apologies of the front desk. The room was quiet and comfortable, the restaurant was well presented, the staff helpful and friendly, check-out and checkin were quick, the airport shuttle was punctual and roomy, overall a good impression. Very easy to transfer from this hotel. A bus comes every 30 minutes to a stop outside of the terminal, and another stop outside of the transit station. Great bathtub and comfortable bed.